TYSONS CORNER, VA, February 7, 2019 — CACI International (NYSE: CACI) has lined up an estimated $975M in funds as it completes the acquisition of rugged equipment maker Mastodon Design and enters into an agreement to buy technology firm LGS Innovations, GovCon Wire reported Jan. 31. CACI said Jan. 30 the transactions are aimed to bolster its innovation efforts in electronic warfare, signals intelligence and cyber operations technologies in support of defense and intelligence customers as well as bring an additional $480M in revenue to the company over the next year. 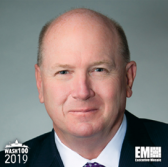 “The synergies in our offerings will strengthen our competitive position while bringing agile innovation to our customers’ missions,” said Ken Asbury, president and CEO of CACI and a 2019 Wash100 awardee.